We woke early to lie in bed watching the kaleidoscope of scenery passing the window as the train trundled along. Early in the morning it was a blue grey shrub that covered landscape. It was sunrise, so the time for seeing animals, but we did not see anything. There were sandy pathways between the shrubs. It was mesmerising. We seemed to be back into cattle country. Having said this, an hour or so later, we had a breakfast on the train rather than on the sheep ranch at Rawlinson Station, that was advertised. Recent rain had rendered the area where we were to have our breakfast waterlogged. 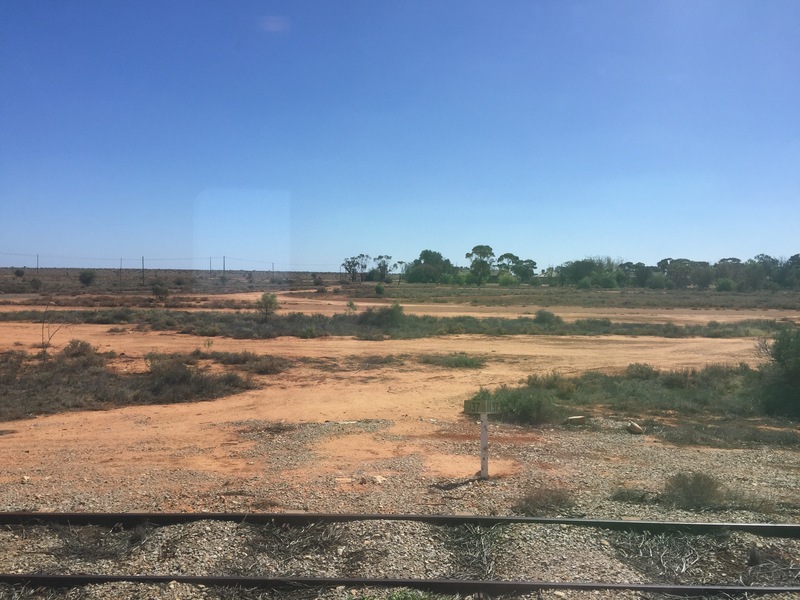 So we did not get to have a sight of what a 2.5 million acre sheep station with more than 70,000 Sheep might look like. I cannot visualise the size or numbers! I am not sure I would have done even had I had the opportunity to have breakfast in their midst! The breakfast on the train was similar to that we would have had on ‘terra firma’ and was huge. I did not want to eat again until dinner time! We whiled away the day watching the scenery. 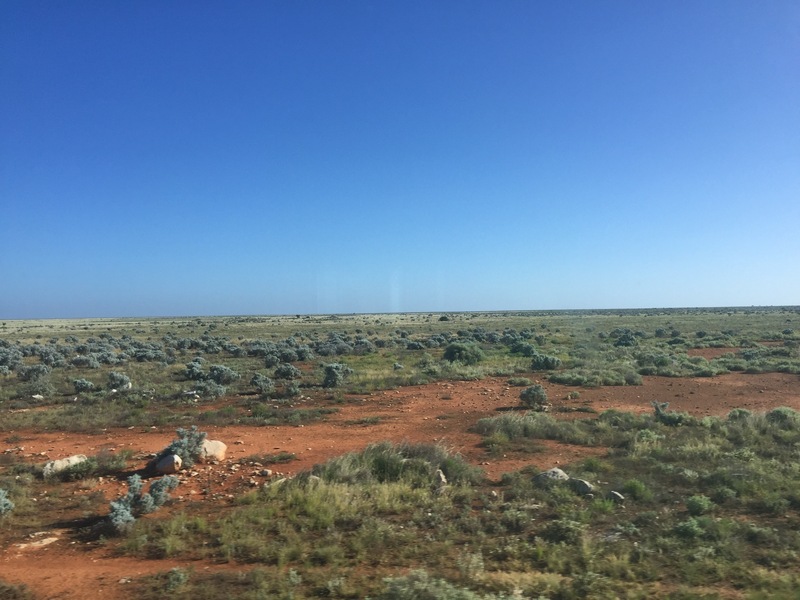 I struck up a conversation with a very nice lady called Aileen as we sat poised at the window with cameras ready to record us passing over the Western Australia border. Needless to say, we were so busy chatting we missed the moment! Plus ca change! A rather dry gentleman pointed out that we had missed a sign saying ‘Welcome to Western Australia’ about five minutes after it happened – helpful! You could only laugh. I passed on lunch having had too much for breakfast. Keith went off with Aileen and her husband Mick while I read my book, consumed a glass of champagne and watched the world go by. 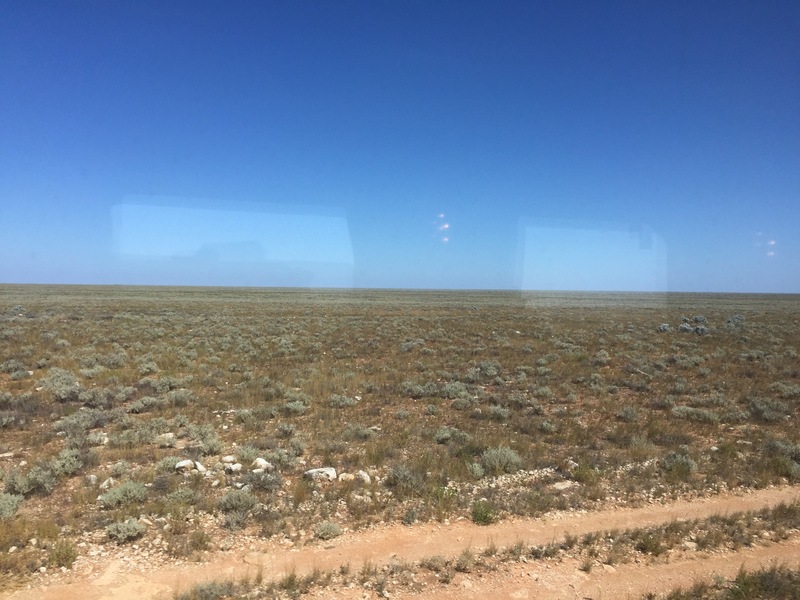 We were now in the Nullarbour desert and on 300 miles of straight track. The longest straight stretch of track in the world. It runs straight for over 300 miles. We had originally considered driving across it, but were dissuaded from doing so. Looking out on the vast landscape we rather wished we had. As it was I had more time to view it. 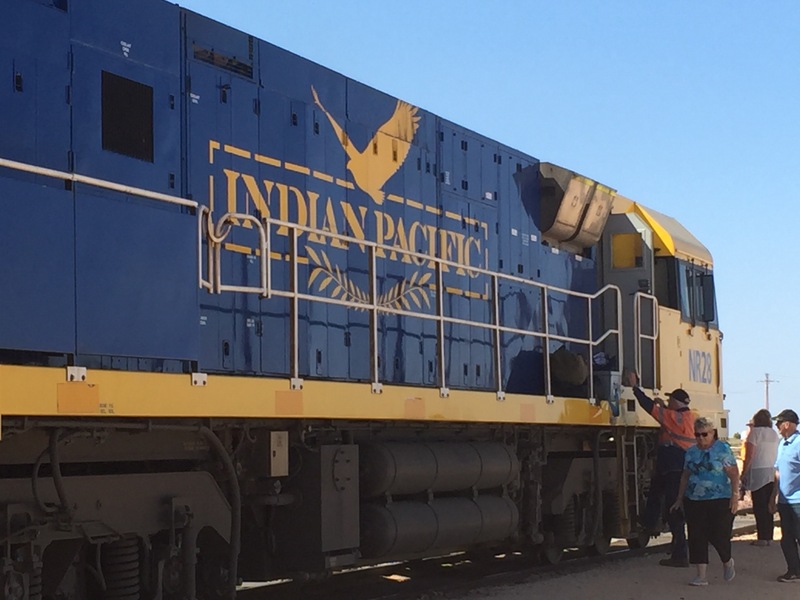 Several times during the day the train stopped to deliver mail and supplies to small communities along the track. One of them, Forrester, had its own airstrip big enough for a jumbo jet to land there if need be. 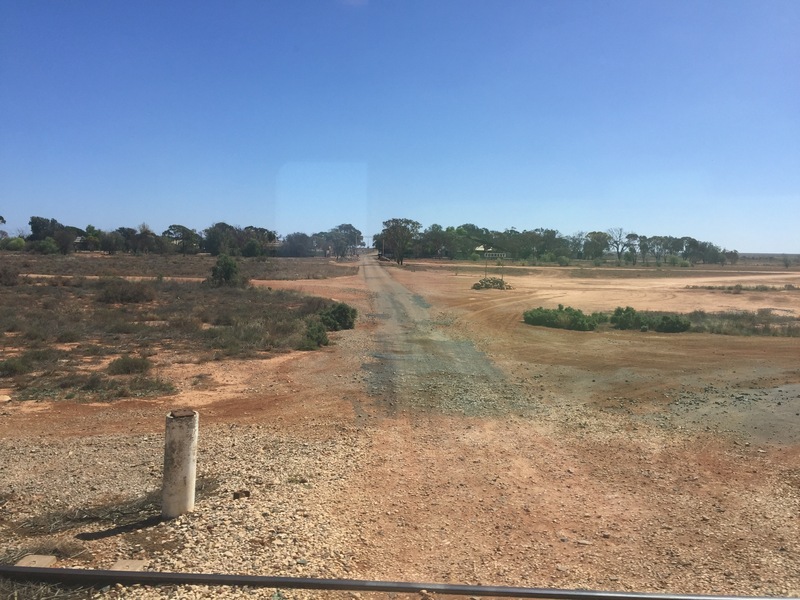 At a place called Cook we stopped to bring mail and supplies and to allow the train to take on more water and change drivers. We had time to get off and stretch our legs. The desert here stretches as far as the eye can see in every direction. 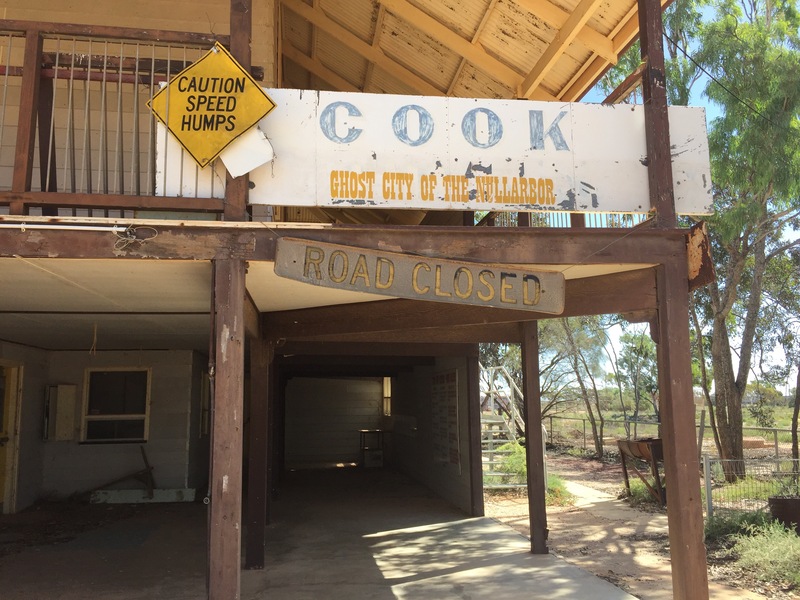 In a previous life there was a small township at Cook. 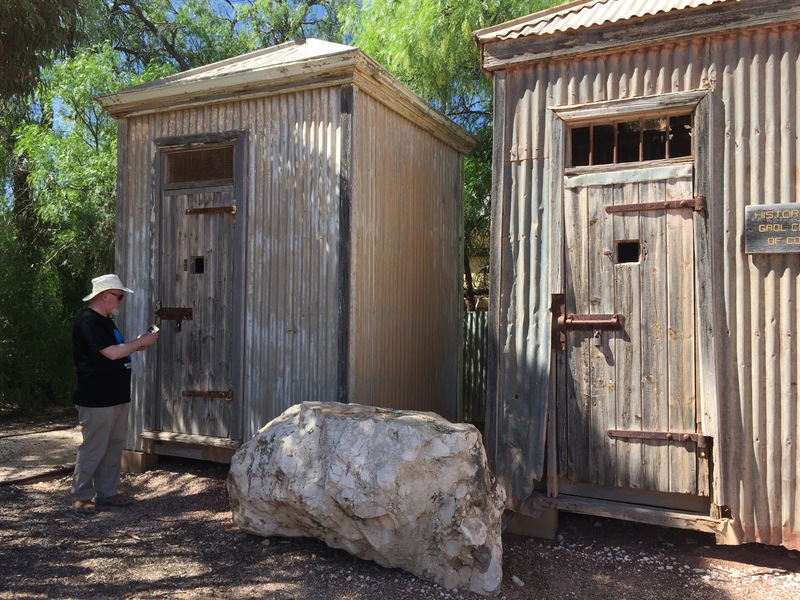 It was established to support the Trans Australian Railway which was completed in 1917. There were a number of small settlements set up to help maintain the line. 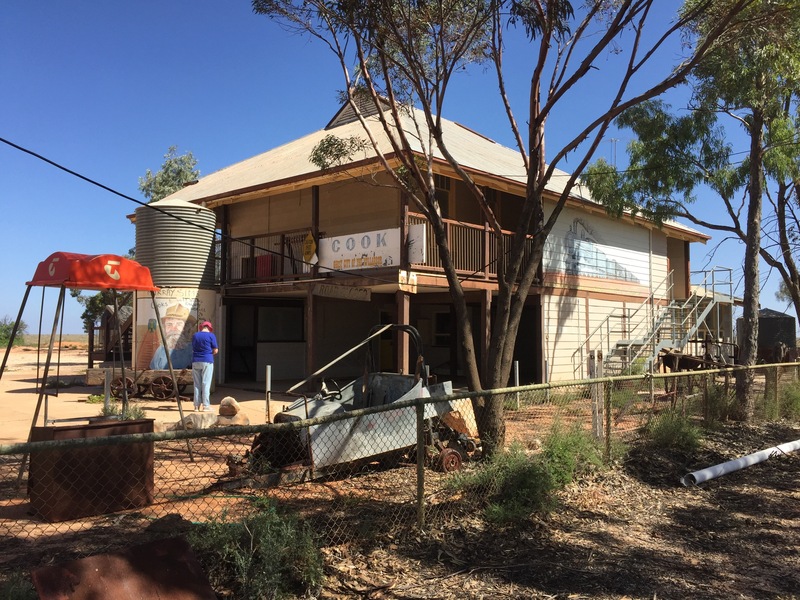 Cook became a major base for this activity providing accommodation for resting crews. At its busiest it had a population of 200. 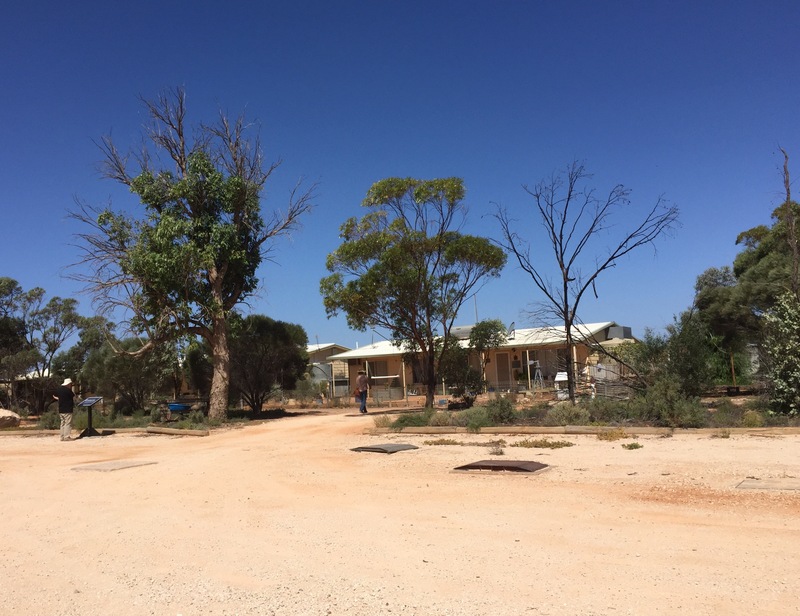 Privatisation of the Railway led to its demise and now there are just 4 people permanently living there. We got out and were surprised that it was not terribly hot. The temperature was comfortable, but the flies were a real problem. We were constantly brushing them away as we looked at what used to be the school house and the two Goal cells. It has a real feeling of isolation and abandonment. 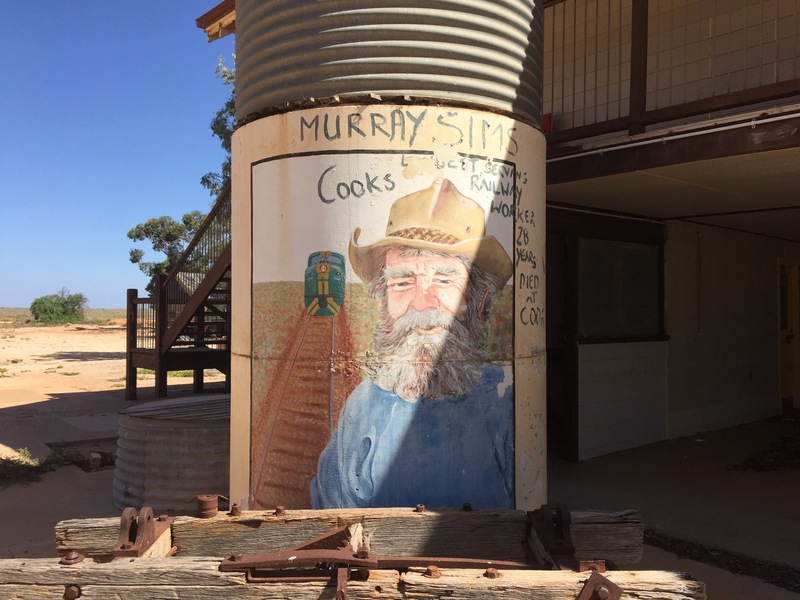 A mural marked the passing of Murray Sims in Cook having worked on the Railway there for 28 years. I can only believed he had a hat well endowed with corks!!! 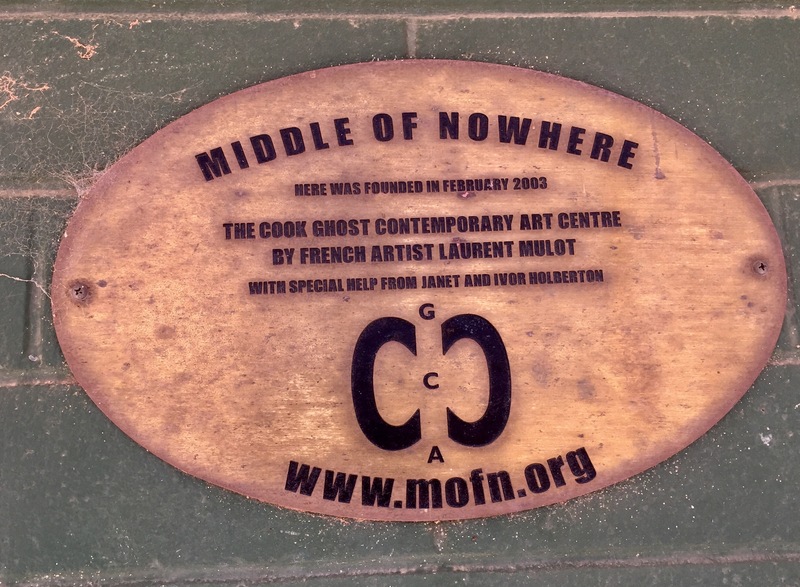 There was also a plaque indicating the time spent there by a French artist some years ago – describing Cook as being in the ‘middle of nowhere’. 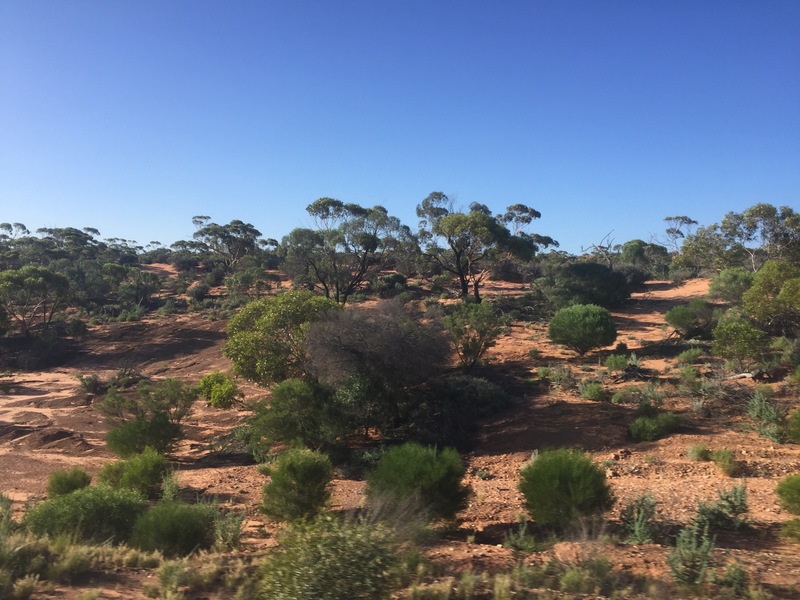 There has been some tree planting in Cook as part of a much larger initiative to make Australia more green. 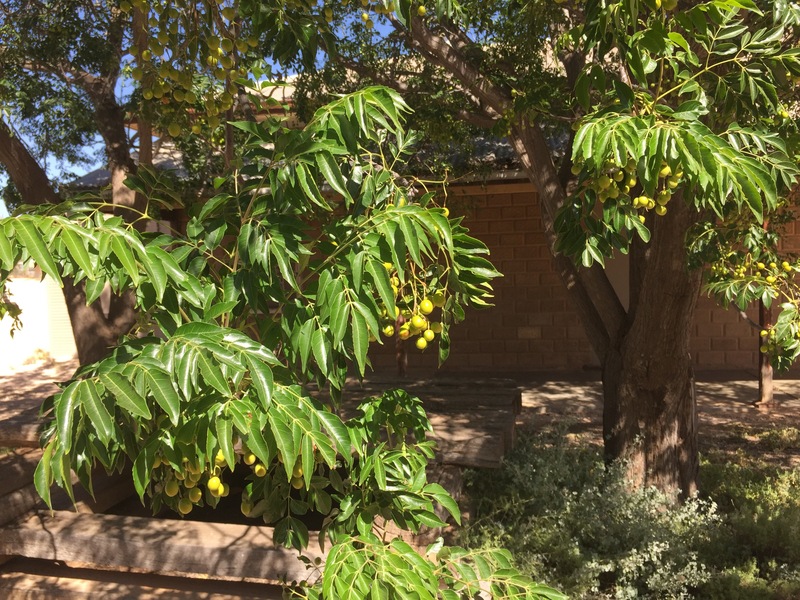 We were somewhat amazed to see a very green leafy tree by the side of the track with fruit on it! I fear someone has to work very hard to keep it going. We got back on the train and our journey continued. At 2.00 pm we had an announcement on the tannoy that we should put our clocks forward 2.5 Hours. Suddenly we were at late afternoon. I was doubly pleased that I had not had lunch as dinner was looming large! 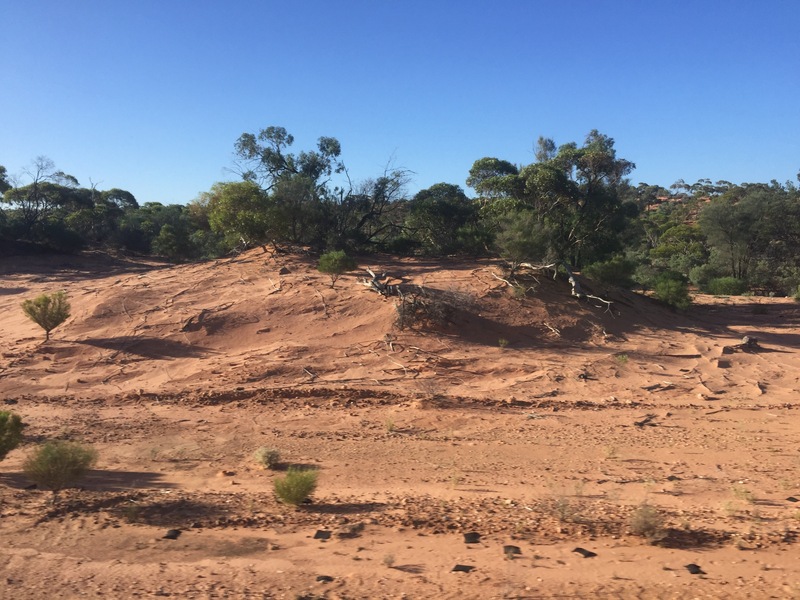 Despite watching very carefully I missed the point the desert stopped and the trees started again, but it happened and we were into a bush area with a floor of red sand banks. We gathered ourselves for dinner and wandered along to the lounge for a pre dinner drink. Here we met up with Mick and Aileen again. A very jolly evening ensued as we found that we were like minded souls, with a lot of similar experiences. They were both retired HR people! (We will not hold this against them!) They come to the UK a lot so I think we will be seeing more of them! What fascinating scenery. Though I imagine that if you had driven across it, you would have been looking forward to a bit more variety towards the end.